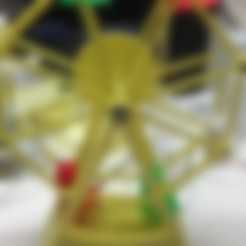 Update : See "Ferris Wheel (yet another)" for the latest. Motorized Ferris Wheel created using Sketchup, Makerware and a Replicator 2. "Ferris Wheel.mov" and "Ferris Wheel Backside.mov" are now included in the download to see it in motion. I'm new at this, so any help, comments, etc. will be appreciated. I have not uploaded the Sketchup 8.0 (not the pro version), files for the various components because I'm not sure if anyone would need them. If needed, I'll upload them. 1) 1, 1/4" by 3 inch rod (aluminum, found at the box hardware stores). 2) 8, 4-40 by 1 1/8" machine screws (found at the box hardware stores). 3) 8, 4-40 hex nuts (1/4" face to face, found at the box hardware stores). 4) 2, Duratrax DTXC1433 1/4" by 3/8" flanged ball bearings (there are two in a package so one package is required, found at a local hobby shop and online). 5) 2, 1/4" by 1/16" nylon washers (found at the box hardware stores). 6) 4, #4 by 3/8" pan head sheet metal screws (found at the box hardware stores. 7) 1, Amico 300RPM 12V 0.6A High Torque Mini Electric DC Geared Motor (located mine at amazon.com). 8) 1, 3 Vdc wall type power supply (found at Radio Shack). 9) 2, 2mm by 6 machine screws (found at a local hobby shop and online). 10) 6, 2mm washers (found at a local hobby shop and online). 11) 16, 4-40 nylon washers (found at the box hardware stores). 12) 1, rubber band (found wrapped around a bunch of green onions at the local supermarket). Assembly.skp is an exploded Sketchup view of the bearings, 1/4" nylon washers, frames and wheels as they should be placed on the 1/4" rod. All .stl files are printed at medium resolution. Make one each of all .stl files EXCEPT for Seat.stl as you will need eight of these (in various colors if you choose). Note that Frame Front.stl has a 1/4" "skirt" around the entire face. The skirt helped me minimize warping during printing (contrary to PLA promises, it does curl, significantly, especially at the corners of large, flat models). After the skirt is printed and a few layers of the model are printed, pause the build, then using glass tape (or equivalent strong adhesion tape), tape down the corners, top and sides of the skirt. After the print is complete, carefully trim away the skirt with a sharp razor knife. To assemble, place Frame Front.stl, face down. Press one of the bearings into the bearing holder on Frame Front.stl. Press the 1/4" rod into the bearing. Place a 1/4" nylon washer, then Wheel Front.stl, Wheel Spacer.stl, Wheel Rear.stl, the second 1/4" nylon washer, and finally the second bearing (flange side touching the second 1/4" nylon washer) on the 1/4" rod. Note that Wheel Front.stl and Wheel Rear.stl must be a tight fit on the 1/4" rod. If not, a small dot of glue maybe used to hold these components on the 1/4" rod. Mount your motor in the center of the base of Frame Back.stl. The motor in the parts list is the one that I used and was mounted by drilling three holes; two for the screws, one for the motor shaft bearing. Mount the motor using the 2 mm by 6 machine screws with 3, 2mm washers per screw (the screws are too long and bottom out before a secure mounting, I couldn't locate shorter screws). Press Pulley Small.stl on the motor shaft (you may need to carefully enlarge the motor shaft hole using an sharp model knife). Now place Frame Back.stl on the rear of Frame Front.stl and secure with 4, #4 by 3/8" screws, making sure the bearing on the 1/4" rod seats in the bearing holder. Mount the seats between Wheel Front.stl and Wheel Rear.stl using 8, 4-40 by 1 3/8" machine screws, 8 4-40 hex nuts, and 16 4-40 nylon washers. Assemble such that the screws enter through Wheel Front.stl, a nylon washer, seat and nylon washer are place on the screw between Wheel Front.stl and Wheel Rear.stl, and the nut is pressed into the nut holder on Wheel Rear.stl. Tighten until the screw is flush with the rear of the nut. The result is the inside dimension between Wheel Front.stl and Wheel Rear.stl should be exactly 1", and the seats should swing freely between Wheel Front.stl and Wheel Rear.stl. At this point, the ferris wheels should spin freely on the frames. If all is well, remove Frame Back.stl, drill a second hole large enough to except the wire from the power supply, then strip and solder the positive and negative wires to the motor. Replace Frame Back.stl. Finally, slide Pulley Large.stl onto the 1/4" rod at the rear the ferris wheel and align it with Pulley Small.stl on the motor, place the rubber band on Pulley Large.stl and Pulley Small.stl, plug it in, and watch it spin. I realize I'm running a 12 Vdc motor at 3 Vdc. I do so because the Ferris Wheel runs slower and is more quiet. I've ordered a few more gear motors and will be trying them. Once the final selection is made, I will add the proper holes to Frame Back.stl in order to mount it. And I also realize the 1/4" rod extends well beyond the rear of the Ferris Wheel. I'm adding more features and have left the long rod to compensate.